Breathe In: The 86 squeezes in to a new home – Garage Dusty Exciting Car Team! 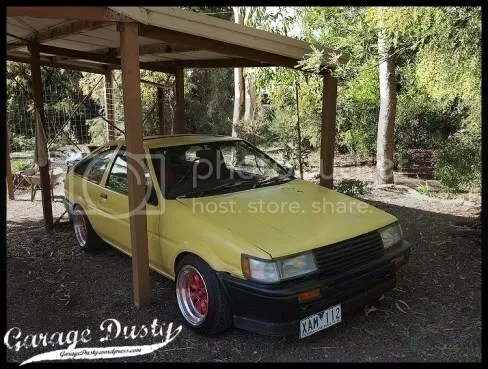 There’s literally no room at Garage Dusty anymore, so the 86 is living at my Mum’s place. Here it is squeezed in to the new digs. As you can see, the Grid-Vs are gone and the XXRs are on. I’m happy with how they’ll look when it’s white. I had intended to start painting this weekend, but ran out of time yesterday and the weather today was terrible. Next weekend it is then.